When you don’t link the due date and you move a stage ahead as long as that stage is still within the next stage, the date won’t move. For example, a stage Draft and Review. The Draft stage is due on 9/14 and the Review stages is due on 9/17, if you move the Draft stage to 9/15 the due date for Review stages won’t move. 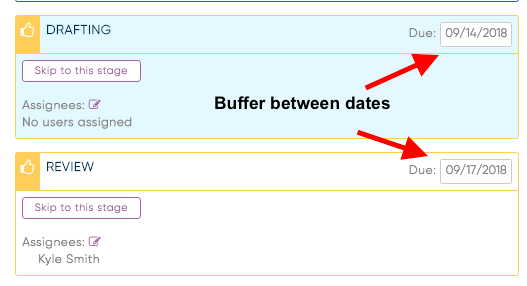 If you link the due dates this is when all the stages following the stage you moved will move forward. For Example, you have a Draft, Review and Design stage. 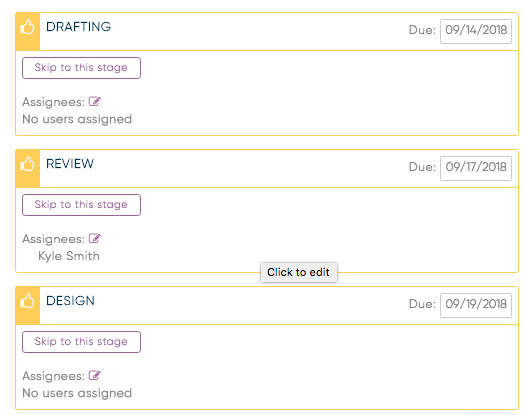 The Draft stage is due on 9/14, Review stage is due 9/17, and the Design stage is due 9/19. If you link the due dates and move the Draft stage to 9/15 all the following stages will move 1 day to Review = 9/18 and Design = 9/20. In addition, the Complete stage will move 1 day as well.